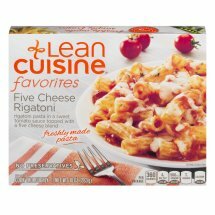 Lean Cuisine® Favorites Five Cheese Rigatoni.Rigatoni pasta in a sweet tomato sauce topped with a five cheese blend.Freshly made pasta.Our promise: No preservatives.Per package: 360 Calories.4g Sat fat, 20% DV.560mg Sodium, 23% DV.7g Sugars.Calcium 15% DV.Net Wt 10 oz (283 g). Lean Cuisine® Favorites Five Cheese Rigatoni. Rigatoni pasta in a sweet tomato sauce topped with a five cheese blend. 4g Sat fat, 20% DV. Net Wt 10 oz (283 g).